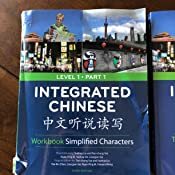 Integrated Chinese Level I Part I Workbook Answer Key . Introduction P1 – P5. Simple Finals. a. a. a. b. b. IC Level I Part I Introduction P1 – P5. Simple Finals. 12/01/2016 · Integrated Chinese Level 2 Part 1 Lesson 1 Narrative Part. 8/03/2016 · Translation from English to Chinese is the hardest part of all practices. This video will explain the answer of Lesson 7 Part 2 Workbook writing practice D.